As many people do, we set up a gift list for our wedding at a well-known UK department store. At first we were a little unsure of what we were going to put on it, given that we’ve lived out of home for a collective thirteen years and therefore had just about everything we needed, but a few hours spent in the Oxford Street branch was long enough to convince us that we hardly had any of the things we needed, and as a result we were able to suggest lots of lovely options for gifts. We always felt that the whole gift list concept of asking people for specific things was a bit weird, but we have to admit that shopping with the barcode scanner was pretty fun: like window shopping, but with a good chance of actually getting the things you’re dreaming about. One part of our list was made up of different components of a dinner set: dinner plates, side plates, cereal bowls, pasta bowls, etc. We thought that it probably wouldn’t hurt to replace some of our Freecycled, drop-it-on-the-stone-floor-and-it-won’t-break, cheap crockery – despite the name (and philosophy) of our blog! Hilariously, though, whilst our wedding guests were very generous and pretty much cleared out the list, not one single item from the dinner set was touched. 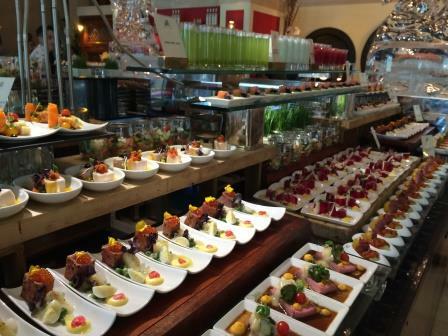 Obviously our nearest and dearest would like us to continue serving ‘good food on bad plates’! After we got married, we had a three-night mini-moon in Dubai on our way back from Australia. A full-blown honeymoon just wasn’t realistic at that point (plus we had just spent three weeks in Australia), so we decided we’d have a few days of post-wedding R&R and delay the ‘real’ honeymoon until next summer. Dubai was everything we hoped for, with temperatures in the low 40s every day, cocktails by the beach, and plenty of all-you-can-eat meals (for that reason, it’s a good thing we were only there for three days). When consulting Professor Google on the national dish of New Zealand, one learns that there are two contenders for the title, pavlova and hângi, both of which proved rather problematic for us in terms of deciding what to make. Pavlova was immediately out of the question, because to concede defeat and acknowledge pavlova as a Kiwi dish would require Miranda to completely turn her back on her Aussie heritage (as if moving to England and marrying a Pom wasn’t bad enough). And there were some obvious logistical problems with hângi, which is a traditional Maori method of cooking in a big pit in the ground. 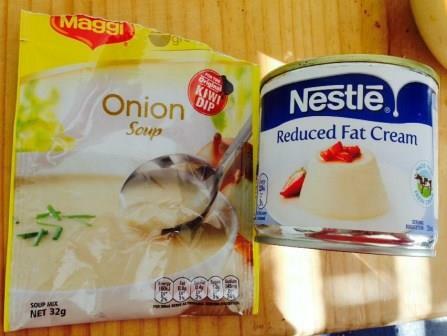 c) supermarkets that stock Maggi onion soup mix and Nestle reduced fat cream. Both of these are key ingredients in New Zealand dishes but are not available in the UK (or if onion soup mix is, it would only be in specialty shops and would cost a fortune).